The last iris painting was so much fun, I decided to do another while I was at it. This view is slightly further back from the flowers in the garden, so there is less close up detail on the flowers but more of them. I also wanted a hint of a suggestion of more iris fields in the distance in the upper left corner to balance the activity going on in the center of interest area in the upper right quadrant and also give a sense of endless fields of irises. I gave my client the choice of whichever version he preferred. Before moving to Atlanta, for many years I lived in Upper Montclair N.J. where there is a place called the Presby Memorial Iris Gardens. The garden was created to honor a horticulturist and founder of The American Iris Society, Dr. Frank Presby, and his work on irises as a legacy and a beautiful gift for the public to enjoy. 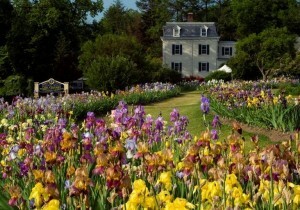 It is absolutely breathtaking- a hill of irises with thousands of varieties. Yes, not only thousands of flowers, but 3000 different varieties of irises-simply amazing! It is stunning and colorful- but fleeting as the blooms are only out for a few weeks in May each year. If you are anywhere near there during that time of year it is a sight to see. I miss seeing it each year but just learned now through the wonders of technology they have a " live iris -cam" on their website, so you can check it out and have a virtual tour when it is in full bloom again next spring. This painting is a special gift for a client who is giving it to his wife for their anniversary. Her favorite flowers are irises, so I went through my reference photos and found the inspiration for this in a photo I'd taken a few years back at Smith-Gilbert Gardens in GA. As an artist it is helpful to have reference photo's on hand because not all commission clients have access to the image they want, when it is needed. Irises are challenging but fun to paint as the leaves and petals offer lots of opportunity for movement and a dance of light and shadow. 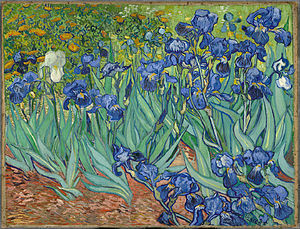 Every time I paint irises it I imagine why Van Gogh must have been drawn to them. There is a fun weaving of leaves, a kind of hide and seek of what is in front and what is behind that is almost like a puzzle. Here's another bouquet painting for a lovely young bride who recently got married in Connecticut . Her mother contacted me to arrange the painting as a gift for her daughter. I typically work from photo's on these type of commission assignments, however in this case the mom was so excited, she wanted me to have the real flowers to work from so she asked the florist to recreate the bouquet and Fedex it to me in Atlanta. The bouquet arrived safely this week. When I opened the box it had an amazing scent and as you can see the bouquet was just exquisite. 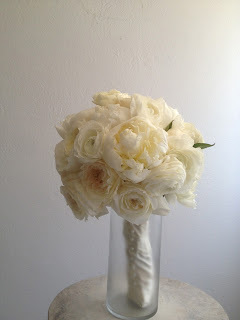 white peonies, roses, ranunculus etc.. Very elegant. The bouquet was designed and created by a talented floral designer Jane Rynaski of Just for You Floral Design Studio. Take a look at her website to see some of her other work- one more beautiful than the next. I had to get started quickly while the flowers were at their freshest. Mom, bride and florist were all very happy with the result shown above. This was the bouquet before it got shipped to me. Having the real flowers allowed me to set up the bouquet in my studio with some attractive lighting. I then took photo's and shared a recommended composition to the bride via email photo and we discussed color preferences. She did not like yellow as much, but loved the pink blush so I took some artistic license and pushed things in that direction. A stark white bouquet would be awfully flat, so subtle warms and cool tints are needed to suggest form and depth. Here's the bouquet in progress in my studio. I strive to have each bouquet painting be a stand alone piece of art - beautiful flowers that capture the essence of the bouquet and that anyone could enjoy. Yet it has an extra special meaning since the couple knows it's a remembrance of their wedding day. It is something that they can see and enjoy each and every day in their home. If you are a bride to be or know of a bride who might be interested, you can learn more about how I can create something special for them on my "Forever Bouquet Paintings" web page. 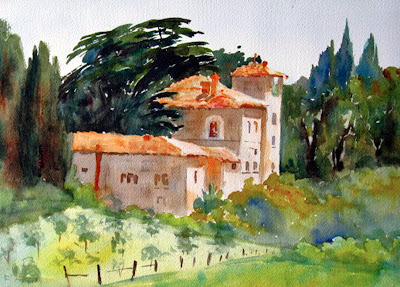 Join us for a special two day studio workshop that will provide all the essentials for painting beautiful landscapes in watercolor. Topics to be covered include how to achieve depth in your paintings, techniques for painting common landscape elements, and pulling all the elements together into a successful composition. 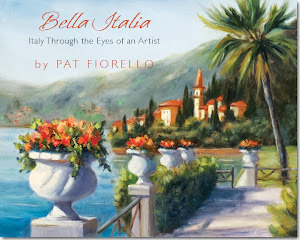 Pat will also demonstrate how to achieve a variety of beautiful green hues. The workshop includes one-on-one instruction, multiple demonstrations, painting exercises, and time to paint from your own photographs. Minimum 6 students, Maximum 12 students.